This part is from Acceglio to Susa. See also part one from Limonetto to Acceglio. 08:50 Manchester flight LH941 arr. Frankfurt 11:35. 13:15 flight LH298 arr. Turin 14:30 (ZKB8PN). Sherpabus to Acceglio: 348 8231477. Taxi to the path junction (1800m) where we left the route two years ago. Walk 4 hours via Colle Ciarbonnet (2206m) to Rifugio Campo Base (1650m). Walk 5¾ hrs via Colle di Bellino (2804m, highest point of the GTA) to Rifugio Pian Melezé (1812m). ‡ See especially "Beo De Blins"! Walk 4⅓ hrs via Colletto della Battagliola (2248m) to Pontechianale (1614m). Groceries on R at Pleyne, 45 mins from start. Walk 5½ hrs via Passo San Chiaffredo (2764m) to Rifugio Q. Sella (2460m). Groceries at start, presumably, and at Castello, 20 mins from start. Walk 2¼ hrs via Colle del Viso (2650m) to Pian del Re (2020m). Morning side trip: Viso Mozzo 3019m, 1km each way, say +1½ real hours. Walk 4 hrs via Colle della Gianna (2525m) to Rifugio Barbara Lowrie (1753m). Walk 3¼ hrs via Colle del Baracun (2373m, look out for botanical gardens) to Rifugio Willi Jervis or Locanda Ciabota (1732m, lunch). Then 1¼ hrs to Villanova (1256m). Trattoria Villanova number unobtainable. Check things out when we get close. Jervis 0121 932755, Ciabota 0121 953477. Walk 6 hrs via Colletta Faure (2110m) and Colle Giulian (2451m) to Ghigo di Prali (1455m). 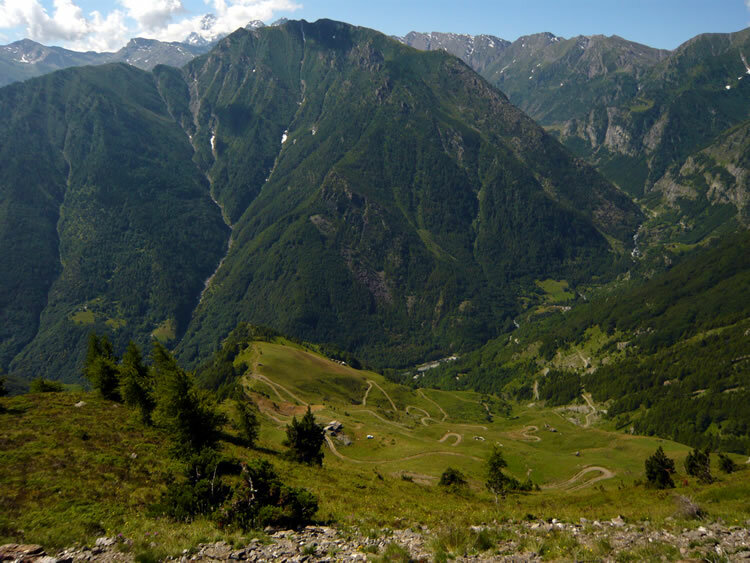 Walk 1¾ hrs via Colle Galmont (1680m) to Rodoretto (1432m). Lunch at nearby Osteria da Mafalda. Then 1½ hrs via Colle di Serravecchio (1707m) to Didiero (1215m). Posto Tappa in Didiero, run by Agriturismo La Miando 0121 801018, “helpful manager will drive you to Balsiglia”. The Posto Tappa at Balsiglia, run by the museum staff 0121 808816, apparently has kitchen and groceries but no restaurant! Read the amusing account by a French purist who spurned the offer of a lift from Didiero, walked on to Balsiglia, and had an "interesting" time of it. The kitchen seems to be a microwave-only affair. 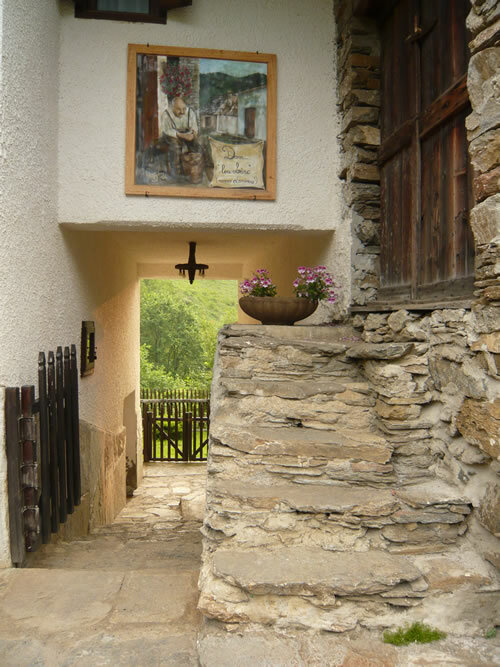 Walk 1¼ hrs ↓130↑300 to Balsiglia (1370m) or get a lift from the Posto Tappa manager. From Balsiglia, walk 6½ hrs via Colle dell'Albergian (2713m) to Usseaux (1416m). Walk 5½ hours via Colle dell'Assietta (2472m) to Rifugio D. Arlaud (1771m). Sat 9 Jul Walk 6½ hours to Susa (501m). Plenty of accommodation in Susa. 13:00 flight LH1897 arr. Munich 14:35. 15:25 flight LH2502 arr. Manchester 16:30.